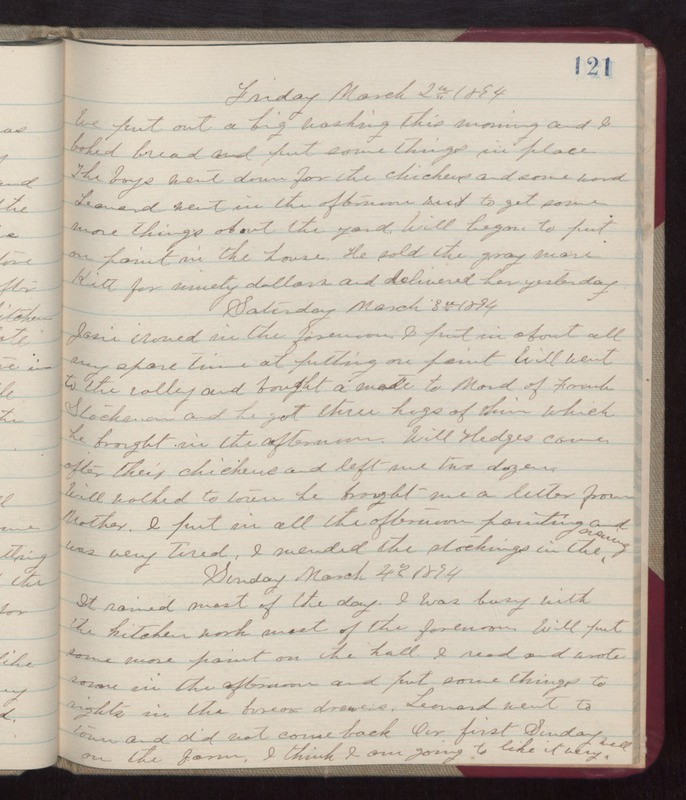 Friday March 2nd 1894 We put out a big washing this morning and I baked bread and put some things in place. The boys went down for the chickens and some wood. Leonard went in the afternoon to get some more things about the yard. Will began to put on paint in the house. he sold the gray mare Kitt for ninety dollars and delivered her yesterday. Saturday March 3rd 1894 Josie ironed in the forenoon. I put in about all my spare time at putting on paint. Will went to the valley and bought a mate to Maud of Frank Stockman and he got three hogs of him which after their chickens and left me two dozen. Will walked to town he brought me a letter from Mother. I put in all the afternoon painting and was very tired. I mended the stockings in the evening. Sunday March 4th 1894 It rained most of the day. I was busy with the kitchen work most of the forenoon. Will put some more paint on the hall. I read and wrote some in the afternoon and put some things to rights in the bureau drawers. Leonard went to town and did not come back. Our first Sunday on the farm. I thing I am going to like it very well.